You need to be able to swim and be reasonably fit. For a try dive you first need to contact us to ensure that an instructor is available to take you in the water. You also need to fill out the try dive disclaimer. To become a member of the club and BSAC you will need to fill out a medical ‘self-cert’ form; or if you have answered yes to any of the medical questions, you will need to have a medical with a qualified doctor; for which you may have to pay a small fee. What does a Try Dive involve? All of our pool sessions are from 8:30 to 9:30 on Monday evenings (please be changed and pool side by 8:15 so you are in good time). One of our qualified instructors will go through the basics of scuba, with an introduction to the scuba kit and how it works. You will then try on the kit and get into the shallow end of the pool for a short lesson with your instructor — if you enjoy the experience of weightlessness and the ability to breathe under water and can’t wait to learn more, then talk to us about membership. As well as your usual swimming gear and towel it is a good idea to bring an old t-shirt in case you get cold, or straps from equipment chaffe. Your training will include a combination of lectures, pool sessions, open water sessions (usually at Stoney Cove in Leicestershire, Gildenburgh near Peterborough, or in the sea at Swanage in Dorset) and a theory exam. The club will loan equipment to you throughout your training. We recommend that you purchase the minimum of a mask, fins and snorkel to begin with, and your own weight belt together with weights when you begin open water diving. You can buy or hire the rest, but will be expected to gradually buy most of the essential kit over the first year or two. Buying new can be expensive, but there are always dive members willing to sell off second hand gear as they “trade up”. For questions about joining or coming to meet us, please contact the membership secretary Email: membership@hackneydiving.org. 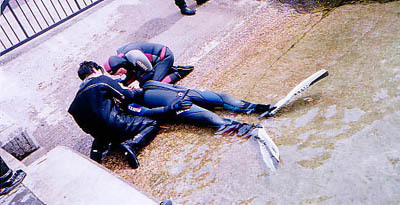 If you are a new diver then why not experience a try dive for £10 (money refunded if you join). Alternatively you can email one of the committee members listed on our Contacts page, or you can approach us on Monday evenings at the pool (8:30 – 9:30 pm) or the Approach Tavern (9:30pm onwards). We will arrange a try dive for you if you have never dived before. If you are a qualified diver we will be more than happy to welcome you to the club and discuss the benefits of membership. BSAC is the British Sub-Aqua Club. As a member of HSAC, you automatically join BSAC, the biggest dive club in the world. The difference between BSAC and PADI is that with BSAC you join a club environment and train at a pace that suits you. You are led through the various stages of training and go on dive trips that the club organises. Both qualifications are universally recognised. Your PADI qualifications are recognised by BSAC. For further details on BSAC visit their website.